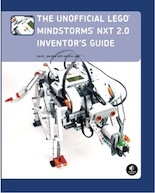 This eagerly awaited second edition of the bestselling Unofficial LEGO MINDSTORMS NXT Inventor’s Guide is your key to designing, building, and programming robots with the NXT 2.0 set. Additional resources include the Piece Library, which contains basic information on the more than 80 types of LEGO pieces in the NXT 2.0 set, and the Quick Reference, which lists the 34 types of standard programming blocks. So go ahead. Grab your NXT 2.0 set, fire up your imagination, and see what you can invent with The Unofficial LEGO MINDSTORMS NXT 2.0 Inventor’s Guide.